2 film, 2 disc double bill of the entertaining Amicus Dr. Who films starring Peter Cushing. Optimum UK R2 boxset. The Films - links to individual film reviews where available. Anyone famous in it? Alongside Peter Cushing as the Doctor, look out for actors Barry Ingham and Andrew Keir and entertainers Roy Castle and Bernard Cribbins. Fans of Peter Cushing and Dr. Who might enjoy this, although the Who-lore is substantially altered for the films. Generally enjoyable family viewing. Visuals All films are in Original 2.35:1 Aspect Ratios and Anamorphically Enhanced. The picture qualities are very good with strong colours and no print damage, although quite noticable grain. The print on the 2150 AD disc is notably better than on the previous UK DVD. Audio Both films are presented with their original English mono tracks which sound fine. Extras Disc 1 includes an audio commentary track for Dr. Who and the Daleks. As included on the earlier release. 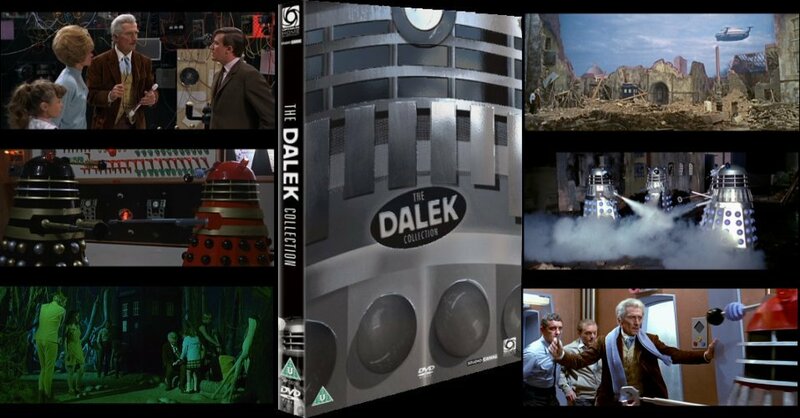 Disc 2 includes the Dalekmania documentary. Interesting but dated. The boxset will include a film poster and set of trading cards. Packing An amaray case, contained within a shiny cardboard sleeve. Other regions? There are OOP UK and US releases of these two films. Cuts? All films are believed to be fully uncut. The prints used are believed to be the same as in the previous UK boxset. A pair of entertaining films that are worth seeing. An decent boxset, with good new prints but no extra features over the previous releases. Recommended if you do not own the films already and might tempt an upgrade for the better prints. All text in this review written by Timothy Young - September 2006. Text from this review not to be used without authorization.